Rubella is generally a mild and self-limited disease in children. During pregnancy, rubella can have potentially devastating effects on the developing fetus. Postnatal rubella is transmitted primarily by inhalation of virus-laden airborne droplets or direct contact with infected nasopharyngeal secretions. In susceptible pregnant women, the virus may cross the placenta and spread through the vascular system of the developing fetus. 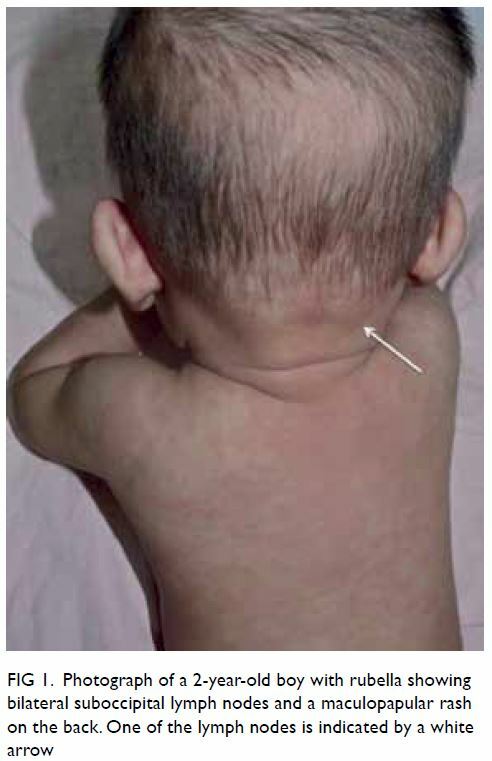 Postnatally acquired rubella typically begins with fever and lymphadenopathy, followed by an erythematous, maculopapular rash. The rash classically begins on the face, spreads cephalocaudally, becomes generalised within 24 hours, and disappears within 3 days. Maternal rubella, especially during early pregnancy, may lead to miscarriage, intrauterine fetal death, premature labour, intrauterine growth retardation, and congenital rubella syndrome. 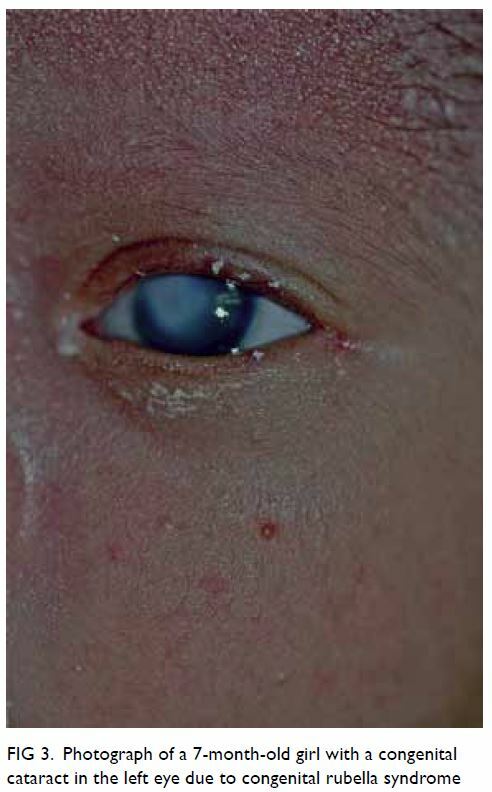 Cataracts, congenital heart defects, and sensorineural deafness are the classic triad of congenital rubella syndrome and they typically occur if the fetal infection occurs in the first 11 weeks of gestation. Laboratory confirmation of rubella virus infection can be based on a positive serological test for rubella-specific immunoglobulin M antibody; a four-fold or greater increase in rubella-specific immunoglobulin G titres between acute and convalescent sera; or detection of rubella virus RNA by reverse transcriptase-polymerase chain reaction. Treatment is mainly symptomatic. Universal childhood immunisation and vaccination of all susceptible patients with rubella vaccine to decrease circulation of the virus are cornerstones to prevention of rubella and, more importantly, congenital rubella syndrome. Rubella, also called German measles, is a communicable viral illness that typically begins with mild fever and lymphadenopathy followed by a characteristic brief appearance of a generalised erythematous, maculopapular rash.1 The disease was described by two German physicians, De Bergen in 1752 and Orlow in 1758, leading to the term “German measles”.2 The term “rubella” was coined by Henry Veale, a Scottish physician in 1866.2 The word “rubella” is derived from the Latin word “rubellus” meaning “reddish” or “little red”. In the absence of pregnancy, rubella is generally a mild, self-limited, and relatively benign infection. However, maternal rubella infection during the first trimester of pregnancy can be catastrophic and can result in fetal death or the birth of an infant with a constellation of congenital anomalies referred to as congenital rubella syndrome.3 This article provides an update on current knowledge about rubella and outlines an approach to its evaluation, prevention, and management. A PubMed search was conducted in November 2018 using Clinical Queries with the key terms “Rubella” and “German measles”. The search strategy included randomised controlled trials, meta-analyses, observational studies, clinical trials, and reviews. Only papers published in the English literature were included in this review. The information retrieved from the above search was used in the compilation of the present article. In addition to congenital rubella syndrome, maternal rubella, especially during early pregnancy, may lead to miscarriage, intrauterine fetal death, premature labour, and intrauterine growth retardation.14 25 Individuals with congenital rubella syndrome are at risk for deafness, blindness, hypertension, cardiac failure, academic failure, reduced life expectancy and, in female patients, early menopause and osteoporosis.37 The disabilities and financial burden associated with congenital rubella syndrome have an adverse effect on quality of life. Rubella should be suspected in a patient with fever, erythematous maculopapular (non-vesicular) rash spreading cephalocaudally from the face downwards, and retroauricular/suboccipital/posterior cervical lymphadenopathy, especially in the presence of arthralgia/arthritis. This is especially so if there is a history of exposure to rubella, travel to an endemic area, or during an outbreak of rubella in an individual without immunity to rubella. Treatment of children with congenital rubella syndrome should be symptomatic and organ-specific and directed to improve the patient outcome and quality of life. Children with congenital rubella syndrome often present with a broad range of problems and therefore will benefit from a multidisciplinary approach. Consultations with, among others, a paediatrician, ophthalmologist, cardiologist, otorhinolaryngologist, and speech pathologist should be considered. Because children with congenital rubella syndrome are at risk for delayed manifestations, long-term audiologic, ophthalmic, and neurodevelopmental follow-up is indicated for early identification of these disorders. Early intervention is important to educate the family, organise the most appropriate educational placement, and plan specialist referral and follow-up. Children with congenital rubella syndrome can transmit the disease as long as they are shedding the virus. Approximately 20% of children with congenital rubella syndrome may still be shedding the virus from the pharynx at aged 1 year and therefore are contagious.3 These individuals should be isolated to avoid the spread of the infection until two throat swab or urine cultures obtained at least 1 month apart are negative for the rubella virus.1 Only healthcare providers with immunity to rubella should be involved in the care of these patients. Apart from congenital infection, rubella is generally a mild and self-limited disease in children. Rubella when acquired by a pregnant mother in an early stage of the pregnancy can have catastrophic effects on the developing fetus and may result in miscarriage, intrauterine fetal death, premature labour, intrauterine growth retardation, and congenital rubella syndrome. To eliminate rubella from a population, universal childhood immunisation and vaccination of all susceptible individuals with rubella vaccine is required. Although rubella has been eliminated from most developed countries, physicians should remain vigilant in recognising both postnatal rubella and congenital rubella syndrome because rubella cases can be “imported” from those countries where rubella is endemic. All authors have disclosed no conflict of interest. All patients were treated in accordance with the Declaration of Helsinki. The parents of all patients provided written informed consent for photographs to be taken and published. 1. Kimberlin DW, Brady MT, Jackson MA, Long SS, editors. Red Book: 2018 Report of the Committee on Infectious Diseases. 31st ed. Itasca: American Academy of Pediatrics; 2018: 705-11. 2. Veale H. History of an epidemic of Rötheln with observations on its pathology. Edinb Med J 1866;12:404-14. 8. Edwards MS. Rubella. Available from: https://www.uptodate.com/contents/rubella. Accessed 5 Dec 2018. 10. Riley LE. Rubella in pregnancy. Available from: https://www.uptodate.com/contents/rubella-in-pregnancy. Accessed 10 Dec 2018. 11. Duszak RS. 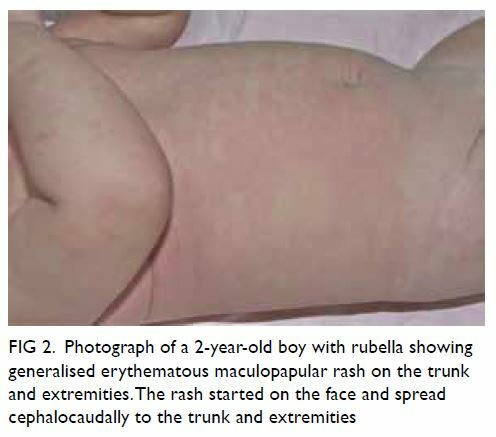 Congenital rubella syndrome—major review. Optometry 2009;80:36-43. 14. Shukla S, Maraqa NF. Congenital rubella. StatPearls. Available from: https://www.ncbi.nlm.nih.gov/books/NBK507879/. Accessed 10 Jan 2019. 15. Rubella vaccines: WHO position paper. Wkly Epidemiol Rec 2011;86:301-16. 16. Martínez-Quintana E, Castillo-Solórzano C, Torner N, Rodríguez-González F. Congenital rubella syndrome: a matter of concern. Rev Panam Salud Publica 2015;37:179-86. 19. Hackett DW. Japan’s rubella outbreak reaches 2,186 cases. 29 Nov 2018. Available from: https://www.precisionvaccinations.com/travel-alert-level-2-remains-active-regarding-japan%E2%80%99s-rubella-outbreak. Accessed 14 Mar 2019. 20. Hong Kong SAR Government. Press release. Public and travellers urged to guard against infectious diseases during Lunar New Year holiday. 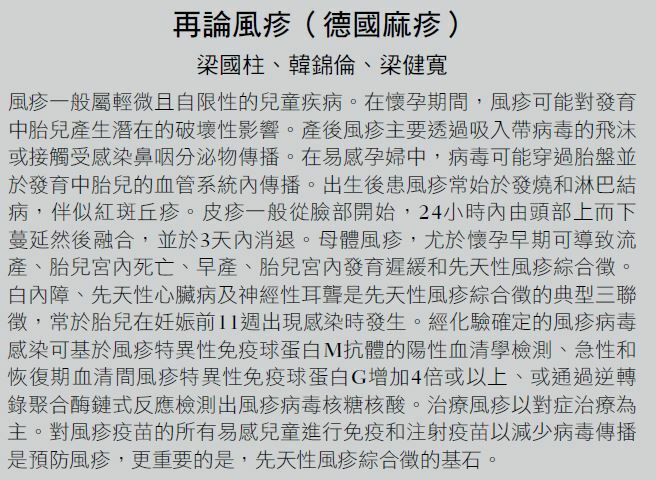 Available from: https://www.info.gov.hk/gia/general/201901/25/P2019012500443.htm. Accessed 10 Nov 2019. 25. 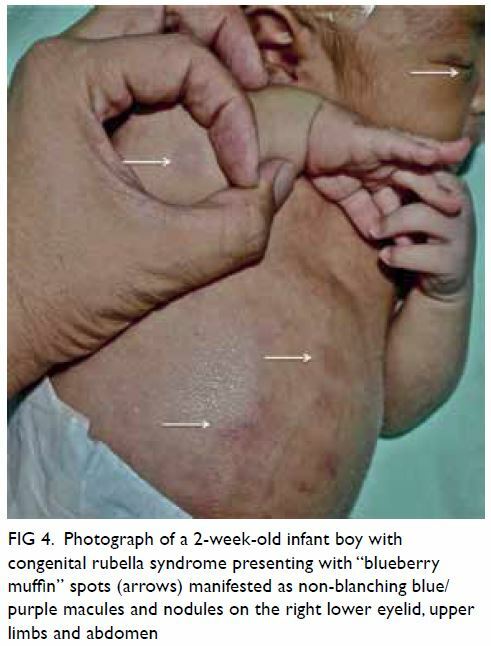 Dobson SR. Congenital rubella syndrome: clinical features and diagnosis. Available from: https://www.uptodate.com/contents/congenital-rubella-syndrome-clinical-features-and-diagnosis/print. Accessed 15 Dec 2018. 27. Bypareddy R, Chawla R, Azad SV, Khokhar S. Rubella cataract and retinopathy. BMJ Case Rep 2016;2016. pii: bcr2016216112. 30. Ahuja R, Shigli AL, Thakur G, Jain U. Dental manifestations of congenital rubella syndrome. BMJ Case Rep 2015;2015. pii: bcr2015209382.